Child-proof your home with the Dreambaby Boston Auto-Close Metal Baby Gate with EZY-Check Indicator. Using optional extensions, sold separately, it can accommodate openings up to 54.5 inch With its one-handed operation, the gate door swings open in both directions but can easily be adjusted to swing in just one direction, making it ideal for placement at the top of the stairs (using the hardware mounting kit supplied). The Magnetic Auto-Close feature automatically closes and locks the gate behind you from any distance, every time. For those times when your child is sleeping, you're bringing in groceries, or entertaining guests, use the gate's Smart Stay-Open feature to move around your home freely. Once the gate is installed, the EZY Check Indicator is a great tool to help ensure your gate is locked, installed, and functioning properly. 29 inch tall and accommodates openings 29.5 inch - 32.5 inch and up to 38 inch with 2 x 2.75 inch extensions included. QUICK, EASY, VERSATILE: Install in a doorway or hallway between 29.5-38 inch (using included extensions) wide. Using optional extensions, sold separately, it can accommodate openings up to 54.5 inch. SAFE & SECURE: Worry less and live more the Magnetic Auto-Close feature automatically closes and locks the gate behind you from any distance, every time. EZY-CHECK INDICATOR: Once the gate is installed, the EZY Check Indicator is a great tool to help ensure your gate is locked, installed and functioning properly. SMART STAY-OPEN: Use the gate's Smart Stay-Open feature to move around your home freely. Simply swing the door in the open position, and it will stay wide open until you are ready to close it. ONE WAY OPENING: You can easily limit your gate to only open in one specific direction by positioning the one way stopper in place. AWARD WINNER: In addition to being JPMA certified, the Dreambaby Boston gate is a Mom's Best Award Winner so rest-assured knowing that this gate is trusted by other parents who have used it. Dreambaby Broadway Xtra Wide Gro-Gate with Track-It Technology is the ideal childproofing tool to protect children from danger and injury around the home. Featuring an innovative puzzle lock and one handed operation, simply lift the gate and follow it through the puzzle pathway to unlock. This hardware mounted gate will fit openings between 30 inch - 53 inch and measures 30 inch tall. The gate will swing open in both directions for easy walk through with no tripping hazards. Utilizing the reversible or removable tab, the gate can be limited to swing in one direction only making it perfect for top of stair use. The unique EZY-Check Indicator helps give you peace of mind by clearly showing if the gate is locked or unlocked. When unlocked the status indicator will be red and when locked and secured properly it will turn green. Dreambaby gates add both style and safety to your childproof home. Boston Magnetic Auto-Close Security Gate - Black Child-proof your home with the Dreambaby Boston Auto-Close Metal Baby Gate with EZY-Check Indicator. Using optional extensions, sold separately, it can accommodate openings up to 54.5 inch With its one-handed operation, the gate door swings open in both directions but can easily be adjusted to swing in just one direction, making it ideal for placement at the top of the stairs (using the hardware mounting kit supplied). The Magnetic Auto-Close feature automatically closes and locks the gate behind you from any distance, every time. For those times when your child is sleeping, you're bringing in groceries, or entertaining guests, use the gate's Smart Stay-Open feature to move around your home freely. Once the gate is installed, the EZY Check Indicator is a great tool to help ensure your gate is locked, installed, and functioning properly. 29 inch tall and accommodates openings 29.5 inch - 32.5 inch and up to 38 inch with 2 x 2.75 inch extensions included. 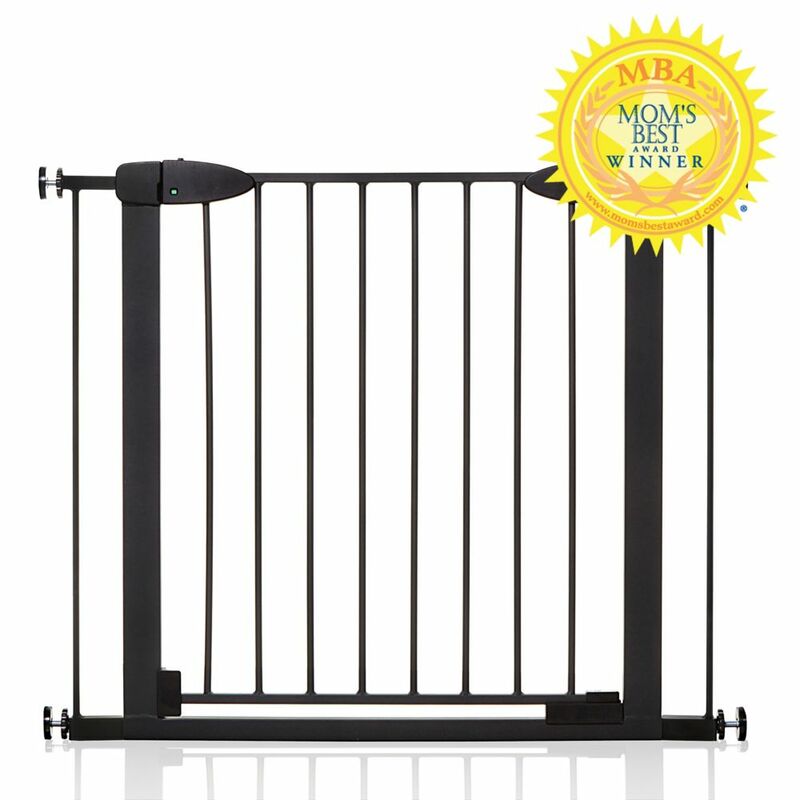 Boston Magnetic Auto-Close Security Gate - Black is rated 4.3 out of 5 by 27. Rated 5 out of 5 by Two Dogs from Great gate, great customer service Great gate. We already had one that worked well to keep our one dog partitioned in the kitchen when we left the house. We bought another one for a new dog for a separate area, and he was able to jump it right away and they were so great with their return policy and allowing us to return the second gate. This is a great gate for narrow openings, and it's also the tallest narrow gate that we found out there, which is a great thing (and I'd say good for most dogs, this second dog just happens to be an amazingly high jumper ... ) Study, well made gate, easy to install (we only used the tension installation and it works well). Rated 1 out of 5 by notsatisfied from Plastic is worn after two months I have been in touch with manufacturer one year warranty guarantee and they won't honor it. Their stance is always the same (as in some responses) that it is installed wrong by consumer. The gate is spring loaded to stay open. it will stay open one way, but not the other. The hold back point is worn down after two months of installation. That means it WAS working. Now it is not. this has nothing to do with the installation. one critical piece is made of plastic and it did not hold up at all. Rated 1 out of 5 by Kate from difficult installation/poor design The installation manual is very brief and unclear. We were not able to install it at the bottom of our stairs. Screw holes are designed so they are not secure with the screws attached to the knobs. They are seemingly stripped, so any time we tighten/adjust the knobs the right side the left slides out of its place and vice versa. Therefore, the opening of the gate will not narrow enough to activate the magnetic feature. I would return this product, but the store I purchased from went out of business.